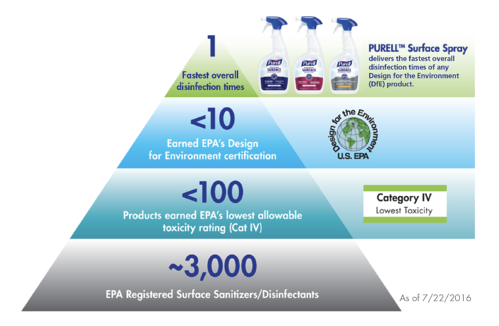 All PURELL Surface Sprays are EPA certified one-step disinfectants and are third-party certified as part of the EPA Design for the Environment (DfE) program. Ideal for disinfecting hard, non-porous surfaces as well as sanitizing soft surfaces, the PURELL Surface Sprays are effective against 27 microorganisms, with efficacy against 22 of those organisms in 30 seconds. For a full list check out the technical bulletin. PURELL Professional Surface Disinfectant is a one-step disinfectant and cleaner that dissipates quickly with no streaks or sticky residue. 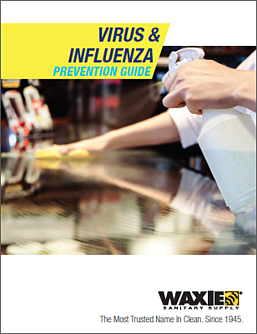 The multi-surface formulation disinfects and cleans hard surfaces and sanitizes soft surfaces. And, the light, citrus scent gives you the peace of mind to use around others. PURELL Foodservice Surface Sanitizer is a one-step sanitizer and cleaner that dissipates quickly with no streaks or sticky residue. The multisurface formulation sanitizes and cleans everywhere you need it, with no rinse required. And the light, fragrance-free scent gives you the peace of mind to use around patrons.